Very early this morning, between the hours of midnight and one, I was kneeling over the toilet in my friend's apartment in Munich (he, out of town for work; his roommates, asleep), throwing up the day's consumptions. Another bug, something I ate, I have no idea. Regardless of the cause, I spent most of today lounging in bed. I watched 500 Days of Summer on Netflix and a writing seminar which had been on my list for a while. I left the apartment briefly around noon, to buy ginger ale from the grocery store across the street, and picked up a pretzel from the bakery too—because goddamnit these are limited days in Munich! Around 3 p.m. I decided to leave the apartment and walk around for a bit. My stomach didn't feel totally at ease, but I wasn't about to hurl either, and I couldn't bare to spend any more of this sunny day indoors. 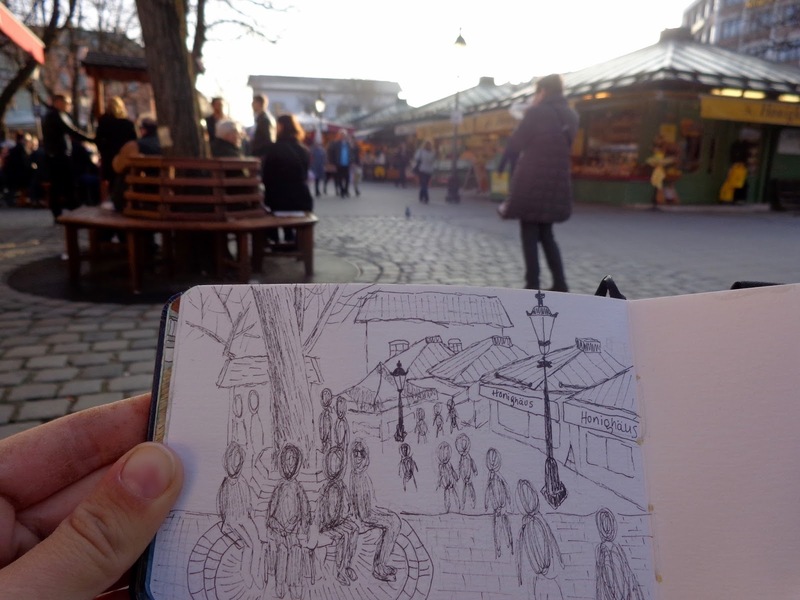 I walked to the center and through a food market, where I sat down on an open seat and pulled out my sketchbook. It took me a while to even start moving my pencil, I didn't have the energy for a 2–3 hour sketch session, the length it normally takes me to pencil, pen, and watercolor a single travel sketch. But my pencil hit paper, and I halfheartedly began to sketch where I happened to be facing. Not feeling up for much effort, it was a good afternoon to finally try my first all-pen sketch, which would save me from having to pull out my watercolors. I didn't even erase the pencil, I just lazily sketched over it in pen. 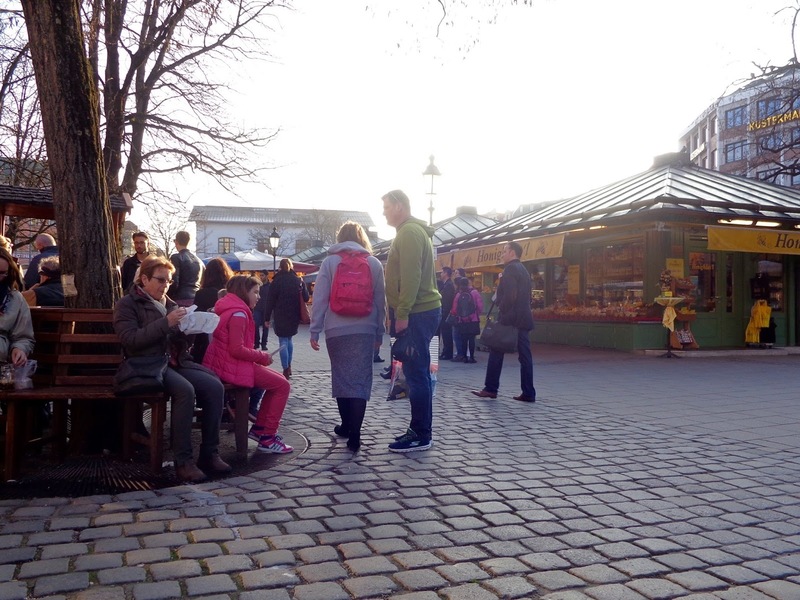 People were blobs, and I couldn't bring myself to add any detail from the market stands—just their roofs. Absorbed in this sluggish sketching, all of a sudden I realized the man next to me had said something to me in German. I looked up, pulled out of my trance, and the expression on my face asked "What?" He said the same line again—in German. "Sorry, I don't speak German," I told him. "It's marvelous, what you're doing," he said in English, "I didn't want to interrupt you, but I just wanted to tell you." I was amazed at the interaction! Travel sketching throughout these past two months has gifted me with several moments of human connection, but I certainly hadn't been expecting to interact with anyone today. I had no color, no effort, no patience. Yet here was this man, letting me know he'd enjoyed seeing me sketching. After thanking him, we chatted for a little bit. He asked me where I was from, and I asked him if he did any art. He likes graphic novels, and his 20-year-old niece is a very talented graphic designer. Later on I learned that his brother has a stand in that very market. Then he asked me if I wanted anything to eat… or something to drink? "Uhhh, no thank you," I said, picturing a nice German pretzel, but knowing I should let my poor stomach recoup. "Nothing? A beer, or something to eat?" "Ah no, I'm okay, but thank you" I told him again. He was standing now, about to go somewhere. "Ok, well, bye" he said. I smiled to myself, grateful for the interaction on a day that had felt like such a waste before. And then I went back to the sketch and started filling in the people blobs with ovals and circles, one after the other. Circle, circle, circle. Oval, oval, oval. This felt like cheating, such a fast way to get people on the page. I didn't have to draw any arms or fingers or faces. Suddenly the man was back and walking towards me, holding out some sort of smoothie from the market. "It's apple/strawberry" he told me, as he handed it to me. "It's not beer, but…it's good." "Wow, thank you," I told him, face aglow. And then he was off, for good. What an afternoon! Hours earlier I'd cursed having stomach problems (again) on my travels, but I'd soon accepted it as reality. And then I was graciously reminded, yet again, that the world is so fluid and interconnected. 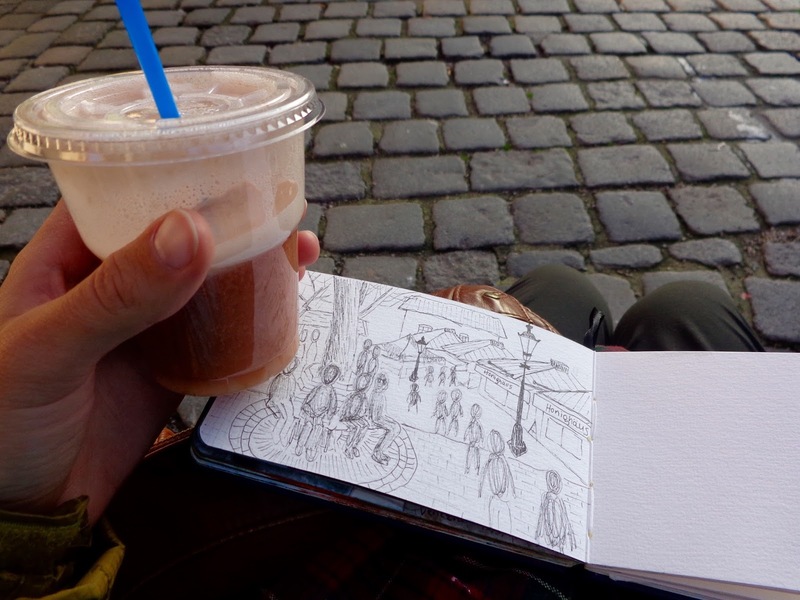 If I hadn't left the house when I did, if I hadn't sat right there in the market, if I hadn't pulled out my sketchbook. Or bigger yet, if I hadn't gotten sick last night. Every small decision made by every person on the Earth, plus nature, that's a good chunk of your reality. And it's all so malleable! It creates both the good and the bad: the moments you cherish forever, the moments that pass by without notice, and the moments you would give anything to reverse. Now consider, for a moment, if the man had sat there as he did, watching me sketch and thinking it was marvelous, but hadn't told me. I'd still have impacted his day, but I wouldn't have known. His comment—that interaction alone, not to mention the juice—had made my day. It made me less bummed about being ill in Munich and spending so much time indoors. But only because he told me. Listen, we're not mind readers. So if you like someone's drawing, tell them. If you think someone's bracelet is pretty, tell them. If someone's podcast helped you in some way, tell them. If a friend or acquaintance has inspired you, tell them. Say it in person, leave a comment on a blog post, send an email, tweet, write a letter. Hearing these types of things will only propel people forward in a positive way. I mean, look at me here typing out this very post! And if these words affect your actions too, look at the huge impact one German man's words and actions are having. And he will never know—I don't even know his name—but his actions still have impact. What this means is that you'll also probably never know a fraction of the impact your actions are making. But even still, the ripples from each of your drops continue to expand through humanity, physically changing our world. 1) Your everyday actions do matter, though you can't possibly know how much they have and will impact others. 2) And it's so worth it to tell people when they've impacted you—big or small. So starting today, look around and be more aware of how others are shaping your life. Then, the vital step: tell them! Who knows the ripples that very drop will create.